Welsh speaking football fans have found an unlikely new source of social media content in the form of Germany's Bundesliga club Schalke 04. Since signing Wales international Rabbi Matondo, the Gelsenkirchen-based club's Twitter account has been praised by Welsh speakers for its #DailyWelsh tweets. 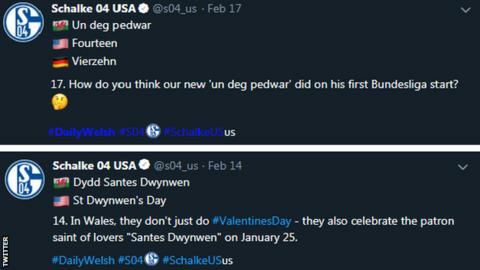 Every day in February, the club's Twitter account has included a new Welsh word with its English and German translation. Director of communication at Schalke, Thomas Spiegel, said the reaction of Welsh fans "could not have been a better motivation" to continue. "When Rabbi Matondo signed for Schalke 04 we hoped that Welsh people would turn their attention to our club and as a result our social media channels," he said. "We hoped it would get a little bit of appreciation but we were very surprised at just how well it was received. "It gave us the idea to do #DailyWelsh in order to continue engaging this new fan base." The Football Association of Wales has complimented Schalke on the use of Welsh language in their social media posts, and has been in communication with the German side about helping with future projects. "It's a great example of how a club can engage its own fans and bring in a new audience through using the Welsh language," said an FAW spokesman. "It shows Welsh as a modern language as was evident during Euro 2016. "It's fantastic to see Schalke embracing the Welsh language and we have been delighted to offer them our support." Spiegel told BBC Sport Wales he was "very honoured" to have spoken with the FAW about future collaboration, and said some Welsh fans had been so impressed with the social media account they had bought shirts and promised to travel to Germany to attend a Schalke match. "While Welsh is not a language that you hear very often, we found out the Welsh are very proud of the language and want to see it used more often," said Spiegel. "There were guys tweeting us saying, 'Schalke is now my team in the Bundesliga and we would love to come over to Gelsenkirchen as you are showing this interest in the Welsh language and Wales'."